Greece is a laid back, carefree, and casual country who respects history, loves philosophy, and has the longest national anthem in the world. 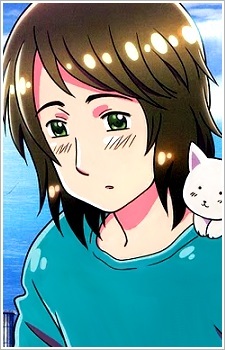 He has brown hair and green eyes, but in a color chart made by Hidekaz Himaruya, his eyes were listed as being teal. His skin tone ranges from olive to fair depending on whether you're looking at a newer or older piece of artwork (in the anime, his skin was depicted as being fair). His longtime rival is Turkey, whom as children, constantly started fights with and conquered Greece. They had still been at odds with each other up until recently when a ceasefire was decided on. Despite this, if they see each other while walking in the street, things could get ugly. His personality is somewhat serious and there is a mysterious aura about him, but he usually takes things in stride and has a mellow outlook on most things. He is usually seen sleeping or playing with cats (a possible reference to Greece’s high population of stray cats), and even though it may seem that he has a head full of air, he usually ponders different topics and thinks a lot about philosophical matters. He respects and honors the Greek gods, which he claims are more humanlike than one might think. Despite his carefree appearance, it is said that he is quite the pervert and a dreamer at heart. He is proud of his beautiful landscapes and olive dishes, all which were created thanks to the warmth of the Aegean Sea. If you dig around in his backyard, many ancient ruins and other mementoes from his mother, Ancient Greece, can be found. He hasn’t been able to build subways or large metropolitan buildings, which makes him seem underdeveloped when compared to other high-tech countries. It was clarified by Hidekaz Himaruya that the cross that Greece is often seen carrying is supposed to represent Mount Athos. Also to note is that his surname, Karpusi (karpoúzi), means “watermelon” in Greek.